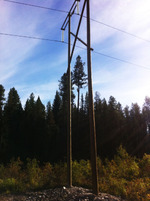 Over the past year we have worked with Pioneer Forestry Consulting Ltd/ BC Hydro providing tree climbing and hazard tree falling along the new transmission line between Golden and Invermere. As part of this project we climbed and topped, bored and scared large trees to be left as wildlife trees. This was a fun project that had us scaling some monstrous Douglas Fir trees that would have otherwise been felled to accommodate the new transmission line. Often we are asked what it is that we do....simply put we safely climb trees to prune, support, and remove.